On Tuesday September 16, I had the privilege to spend the afternoon with some students at the Greater Pittsburgh Urban League Charter School in the East Liberty neighborhood of Pittsburgh. 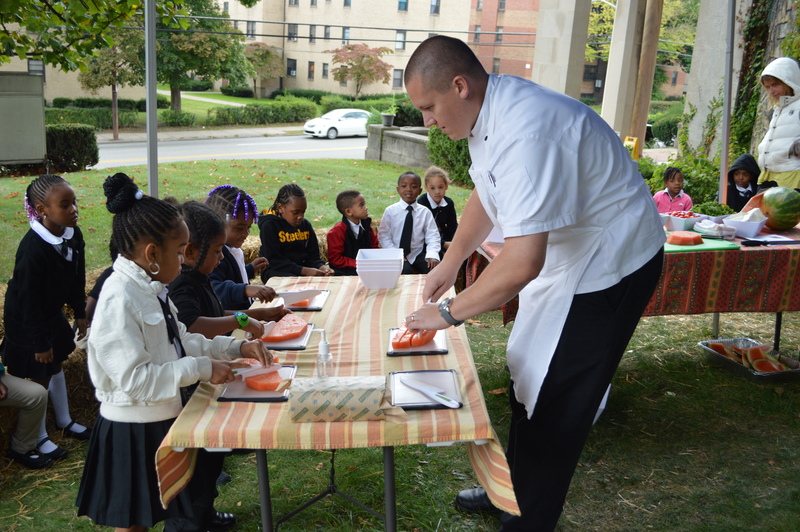 Grow Pittsburgh has a terrific Edible Schoolyard program that creates on-site gardens at schools around the city where students learn everything from planning and planting a garden to harvesting and cooking what they grow. 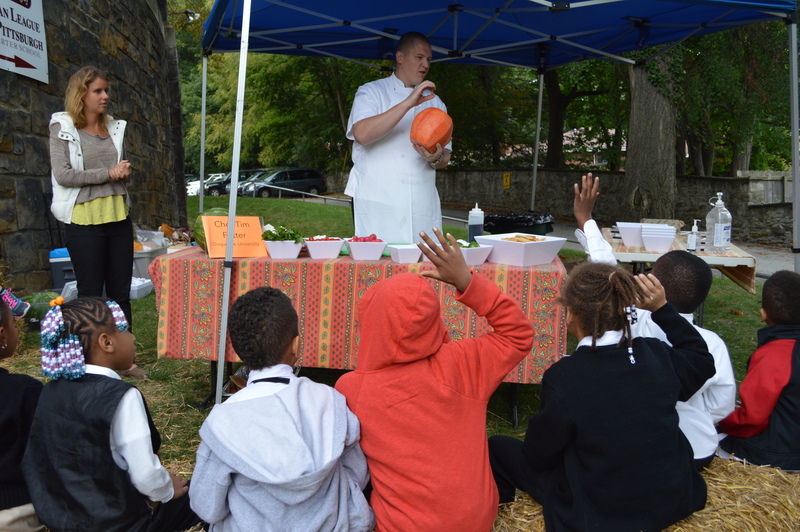 As part of this program, they bring area chefs like myself to do cooking demos and get the children interested in trying new foods and creating simple yet creative dishes at home. For the demo, I wanted to come up with a dish that would be relatively simple, great looking, great tasting, and something that the students would be willing to try. My initial idea was to do a compressed watermelon salad, in which you vacuum seal the watermelon with other ingredients to pull all of the air out of it and permeate it with the other flavors. After discussion with the team at Grow Pittsburgh, we decided that this may be a little over the heads of our younger students and would be difficult to duplicate at home. So, I adjusted the recipe (see below) to make a simple, colorful, flavorful, and elegant dish the kids would enjoy. 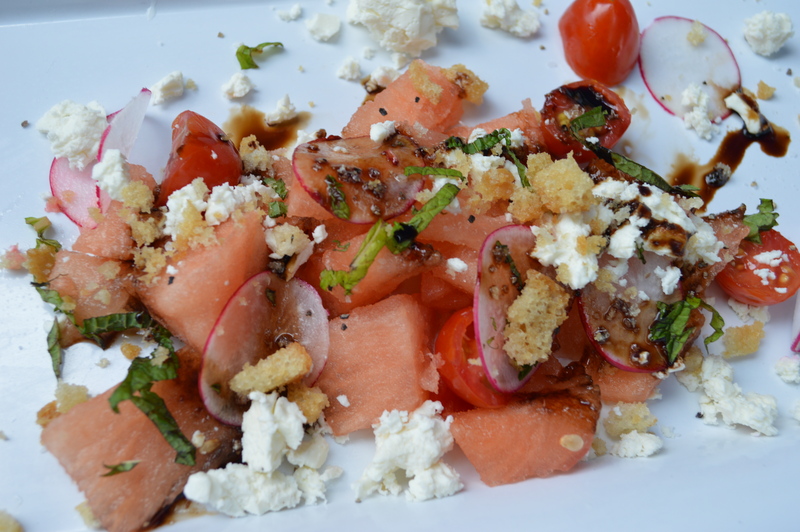 The result was a Watermelon and Feta salad with tomatoes, radishes, mint, lime juice, balsamic reduction, and crushed up croutons. I wasn’t quite sure what to expect when I showed up at the school, but was very pleased to see the setup of a pop up tent with hay bales set up around it for the students to sit on. Once the first group came out and showed their enthusiasm, I knew it would be a great afternoon. The kids were very excited to be outside and to be a part of something outside of their daily routines. I was surprised by how willing all of the students were to both help make and actually try the salad. We even had a large number of students join the “Clean Plate Club”, coined by Maria and Molly from Grow Pittsburgh if they ate their entire sample portion. All in all, working with the kids was great experience and getting them excited about food and cooking was very rewarding. I recommend to everyone wanting to make a difference to get out there volunteer your time. The World’s largest watermelon weighed in at 350 lbs. Dice the watermelon and tomatoes and set aside. Take the mint or basil leaves and stack them up and roll them up as tight as possible. While holding them, carefully slice them in very thin strips. This is called a chiffonade cut. Set aside. If you have a mandolin (angled vegetable slicer), carefully slice the radishes in paper thin discs. If not, slice thinly with a knife and set aside. To assemble the salad, you can either toss all ingredients together and immediately serve or layer the ingredients in the order that they are listed above. Notes: Be sure to serve this shortly after making it, because if it sits too long, the salt will start to draw all of the moisture out of the watermelon and tomatoes. Making balsamic reduction is as simple as taking some balsamic vinegar and a little honey or sugar and simmering on the stove until it is reduced to a syrup like consistency. This is a versatile salad that can be altered in many ways, so feel free to substitute your favorite ingredients and see how it turns out.